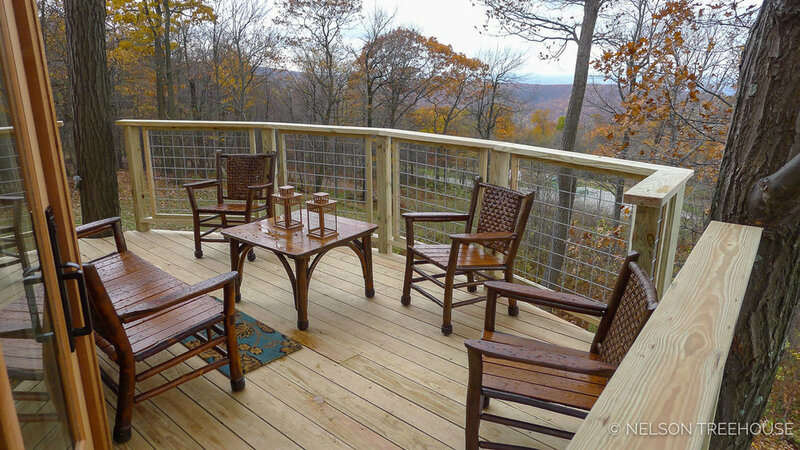 Located at the historic Summit Inn Resort in Farmington, Pennsylvania, this cozy treehouse offers sweeping views of the surrounding forests and ties visitors back to the resort’s roots. With its built-in bar, wraparound deck, and suspension bridge, this treehouse is the perfect place for relaxation and time spent with friends—and bears! The large windows and ground level “bear cam” provide ample opportunities to safely spot the many black bears that call Farmington their home. Pete was inspired by the resort’s ski lodge, which burned down in the 1960s, and alluded to its unique shape with the decagonal roof design of the treehouse. A 45-foot suspension bridge leads to the front door. The crew installed over four feet of concrete to support the bridge abutment. Three black oak trees provide all the support for this 165-square-foot treehouse. The platform rises 20 feet off the ground at its highest point. A custom steel yoke and four TABs form a rock-solid hardware foundation for the platform. As they make their way to the front door, visitors can give a little love to one of the host oaks.. The inside holds plenty of comfy seating, a dining table, wide windows, and a built-in bar. The bar top swings down from the wall—it can also be tacked up to make space below for dogs to snooze. This cozy treehouse is the perfect place for the inn's owners and guests to unplug and relax. The vintage light fixture above the table came from the basement of the historic inn! From the back of the wraparound deck, guests can see into two states: Pennsylvania and West Virginia. The views are spectacular, especially during autumn when the leaves change color. You can visit this treehouse as a guest of Summit Inn! The resort offers tours—you can learn more on their website, here. We hope you've enjoyed taking a closer look at the Black Bear Bungalow. You can see all our photo tours of treehouses from episodes of Treehouse Masters, here.